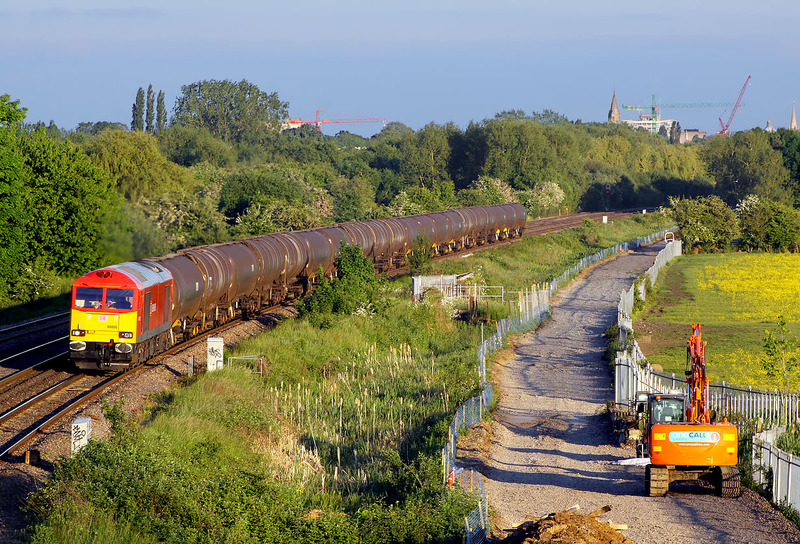 60020 passes Wolvercote in glorious evening light on 9 June 2013 with the late running 6E38 17:03 Colnbrook to Lindsey Oil Refinery aviation fuel empties. It is passing the work site for the soon to be reinstated down relief line (which no doubt in future years it would make use of). At this point there is a considerable distance between the lines, with a ditch in between. Unfortunately construction site cranes seem to outnumber Oxford's 'dreaming spires' in the background! However, the Radcliffe Camera, and St Mary's Church, can just be seen on the extreme right.